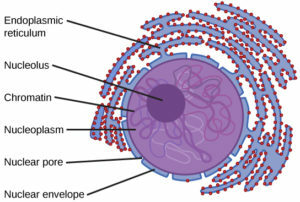 Typically, the nucleus is the most prominent organelle in a cell (Refer back to Figures 7 and 8). The nucleus (plural = nuclei) houses the cell’s DNA in the form of chromatin and directs the synthesis of ribosomes and proteins. Let us look at it in more detail (Figure 10). The nuclear envelope is a double-membrane structure that constitutes the outermost portion of the nucleus (Figure 10). Both the inner and outer membranes of the nuclear envelope are phospholipid bilayers. The nuclear envelope is punctuated with pores that control the passage of ions, molecules, and RNA between the nucleoplasm and the cytoplasm. To understand chromatin, it is helpful to first consider chromosomes. Chromosomes are structures within the nucleus that are made up of DNA, the hereditary material, and proteins. This combination of DNA and proteins is called chromatin. In eukaryotes, chromosomes are linear structures. Every species has a specific number of chromosomes in the nucleus of its body cells. For example, in humans, the chromosome number is 46, whereas in fruit flies, the chromosome number is eight. We already know that the nucleus directs the synthesis of ribosomes, but how does it do this? Some chromosomes have sections of DNA that encode ribosomal RNA. A darkly staining area within the nucleus, called the nucleolus (plural = nucleoli), aggregates the ribosomal RNA with associated proteins to assemble the ribosomal subunits that are then transported through the nuclear pores into the cytoplasm.